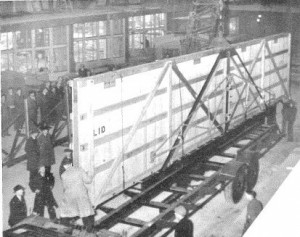 On the 15th October 1950, the manufacture of 20 large glass ‘blanks’ started, from which the large window was to be cut. 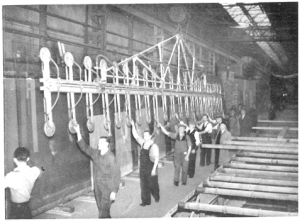 With each piece measuring 70ft in length, the glass panes were carefully manoeuvred through the factory under the watchful eye of Pilkington Polishing and Quality Experts, Bill Clarke and Fred Fairclough, who the next morning successfully managed to craft the record breaking glass plane on the first attempt. After the window was cut down to its final size (50 feet long by 8 feet wide), the next problem that arose was the matter of a 160 mile journey from Plate Works (Sheffield) to Westminster (London), where the glass pane was due to be displayed at the Festival of Britain. This task was left to the transport department, who searched the country for a suitable vehicle to carry the precious cargo. 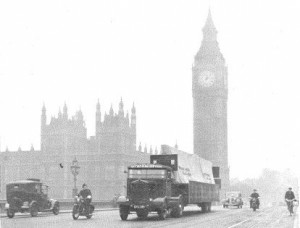 By the morning of 17th October, everything was prepared and the glass pane was ready to embark on its five day journey to London, travelling at a maximum speed of 8mph. Delivered in ‘perfect order’ on the 23rd October, the masterpiece served its purpose and was later cut up into smaller, more manageable panes for all those involved to have as memorabilia.